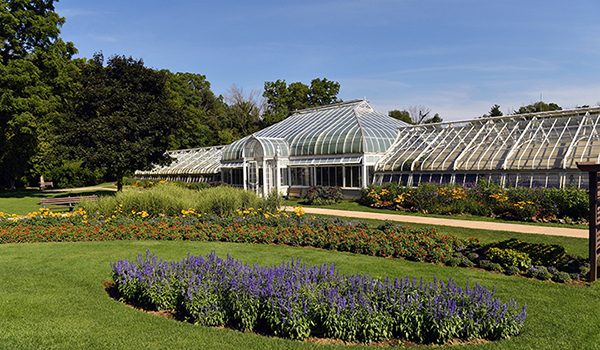 The Greenhouse & Conservatory was constructed at its current site in the early 1900's. This Italian Renaissance-style facility, designed by Lord and Burnham Company, features spectacular floral shows with seasonal motifs during the fall, winter and spring. Year-round attractions are offered with a tropical house, cacti room and show house. 8 AM - 4:30 PM, 7 days a week. Closed on holidays. The Birdhaven Greenhouse requires Photo Permits for groups or individuals using a Professional Photographer. The fee is 20.00 per one hour session. Appointments must me made in advance of the session date by calling 815-741-7278. Teachers, bring your students to visit our new Tropical and Desert Houses. We also have classes that can be brought directly to your classroom. Call 815-741-7278 for more information.